Of course, in some cases, proper care won’t be relevant if the sponges are of low quality or if the sponges aren’t meant to last… but if you own a high-quality loofa sponge or any other natural sponge, you should always aim to keep it in good shape. Natural Loofa, Bath Sponge and natural bristle brush. Before we tell you the basic steps you need to follow in order to properly treat your sponge, there are a couple of guidelines that you should always live by if you are to get the best out of your product. There is only one instance in which a bath sponge owner should opt to use bleach when cleaning their products and that is when the sponge is made entirely of synthetic materials. 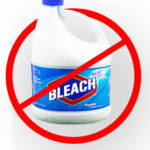 You should never apply any sort of bleach to natural sponges! Their organic composition will deteriorate and weaken over a short amount of time, eventually rendering them unusable. Natural sponges could also suffer immensely when exposed to a high amount of heat. If you’ve ever thought about drying your sponge with a hairdryer, a microwave or even by placing it inside your clothes dryer, we strongly suggest that you use a different method. These hot conditions will harden the structure of the sponge, turning it practically unusable. The sponge is also very likely to shrink while hardening. Regardless of the nature of your sponge, if you’re using an organic cleaner you should always soak it in water before putting it to use – especially if you’ve bought it online and received it on a package. As we’ve already told you on some of our product reviews, sponges tend to come flattened and they harden when not exposed to humidity. This is usually an indicator that the sponge is indeed natural, but you’ll need to apply water if you want it to work as intended. In any case, as the experts of the SeaSpongeCompany.com suggest, natural sponges should be soaked on a mix of warm water and baking soda at least once every two weeks. The amount of soda you’ll use depends entirely on the size of your sponge: the larger the sponge, the more baking soda you need to apply. Dry it completely after each use: It doesn’t matter if you intend to clean the sponge soon or not, be sure to always dry it as much as you can after using it in order to prevent water storage. Be sure to properly rinse it: Make a habit of constantly rinsing your sponges after each use. This will free any trapped water and bacteria inside them, which will, in turn, halt any possible future growth. It is important that you avoid twisting the sponge as this could be detrimental for it and it could also permanently damage its shape. Soak the sponge in baking soda: As we told you before, a mixture of water and baking soda is ideal to purify your natural sponge. As the Sea Sponge Company suggests, this behavior reinvigorates its cells and allows it to stay functional for a longer period of time. After cleaning and rinse it, don’t leave it out in the open: People usually keep their sponges nearby or inside their bathroom, which is a pretty humid environment. This usually accelerates the growth of bacteria, so we advise you to store it somewhere dry. If you feel like there’s still dead skin or bacteria in your sponge, use colloidal silver: Mix warm water with a small spoon of this substance and let the sponge soak on it for around 5 minutes – this should be enough to get rid of anything harmful contained within your sponge. Avoid naturally sensitive areas of your skin, like your face: Even after you’ve properly cleansed your sponge, some small bacteria residues could remain contained within it. Although most people don’t scrub their faces, we strongly suggest you avoid this practice. Do not scrub around or near any sort of wound: These openings on our skins are entryways for bacteria, and it is very important to avoid using sponges near them. Replacing your sponge: It is important that you replace your sponge at least once a month. If you’ve purchased a large sponge and you don’t want to throw it away so soon, we advise you to cut it into different pieces and use each one individually. This sort of practice is common amongst owners, especially those who have bought sponges like the Natural SPA Beauty Egyptian Organic Loofah by CraftsOfEgypt. Be sure to keep your natural sponges free from water after each use, rinse them and clean them once a week and replace them every month. Sounds simple enough, right? If you don’t want to spend too much money on a product that you’ll have to throw away relatively soon, we encourage you to check out our loofa sponge reviews so you can decide which product to purchase. Our objective is to break down each of the most popular products on the market and offer you advice on which one to get depending on your needs. Click here to read why you shouldn’t use bleach if you have a septic system in your home. Do you have any questions? Feel free to share them with us in the comment section!